Whenever I draw this card, it gives me goosebumps. 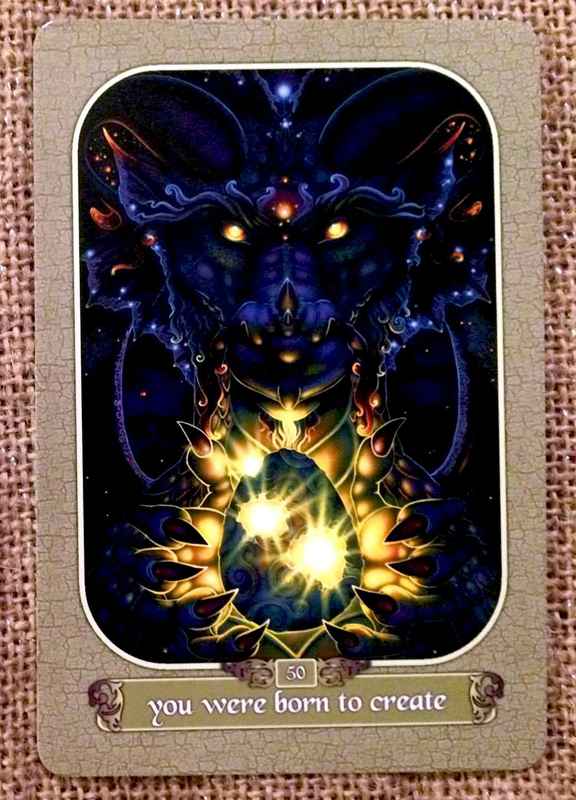 It remind me a bit of a fortune teller over a crystal ball, while it’s also an intense dragon handing you the gift of remembering your own gifts. With eyes that say, “Use them or else!” The “or else,” of course, being losing a bit of yourself every time you ignore your soul’s call to create. Paint, build, write, garden, nurture, or whatever is your form of creation and creativity. You were blessed with the ability to create with thought, intention, action, and emotion. Be conscious of your power and aware of what your actions and reactions create within and around you. Cherish this gift and use it in both a wise and productive manner. Create beauty, and inspire a desire within others to do the same. Create a future that both fulfills and delights. Do what you were born to do.